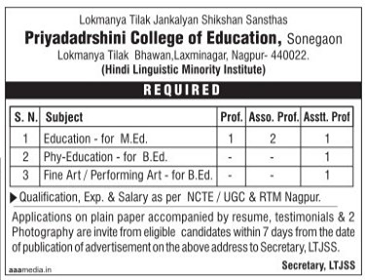 Priyadadrshini College of Education, Nagpur has advertised in LOKSATTA for the recruitment of Professor/Associate Professor/Assistant Professor jobs vacancies. Interested and eligible job aspirants are requested to apply with in 7 days. Check out further more details below. About College: The institute is located at Sonegaon in Nagpur. It is about 2 k.m. from khamla. The College campus provides ideal atmosphere for academic pursuit. It provides student friendly climate with employment oriented courses program.